Welcome! Want to serve? Looking to make a difference? Know you need to VOLUNTEER? Want to take the NEXT STEP? Interested in baptism, membership, children’s program, teens, missions, etc.? You will find some answers here! We’re a multi-ethnic, urban church with a passion to Reach, Teach, Mend, Empower and Send. Our ministries are filled with energy, creativity, and heart. Every ministry has room for another set of hands and fresh thoughts and ideas. Check out these pages and see if one doesn’t grab your attention. Listen to God as you look at what’s available. Don’t hesitate to ask questions. At Breakthrough Ministries we believe you were designed with a destiny and that serving the church and the world is a part of God’s plan for you. We want to help you find the right fit for you! Please catch your breath and join us as we seek to re-dig the WELLS OF REVIVAL. Youth for Christ is a young adult study offered on Friday @ 6pm in the sanctuary. Youth for Christ is designed for young adults between the ages of 18 and 25. YFC is an opportunity for young adults to fellowship and fully participate in the body of Christ. YFC Friday nights are loaded with adventures into the Supernatural, fun, discussions, questions, reflection and love. Please stop by and join us any Friday night. Join us in our goal to RAISE A NEW BREED WITHOUT GREED, RADICAL OPPOSITION TO CORRUPTION. Breakthrough International Christian Center was founded in 2010 from a Prayer group started to address the prayer, health and spiritual needs of LLCF and also to attract new people to commence a 3rd service which is now Noon Service in Long Beach. Breakthrough Service served the above purpose for six months and transitioned to a Church plant. BTICC meets at 5230 Clark Avenue, Suite 25, Lakewood CA. 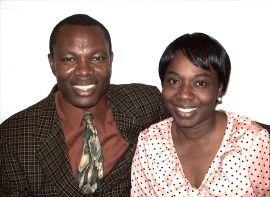 God called and commissioned John and Joy Ogbonnaya to pastor and to lead a restoration movement, in order to forge a vessel of recovery, a group of Christians who are ready to obey the scripture by imitating Jesus. “…the works that I do shall he do also; and greater [works] than these shall he do; because I go unto my Father.” BTICC is a multi-ethnic church. Breakthrough International Christian Center is impacting the World locally, nationally and globally. 5230 Clark Avenue, Suite 25.